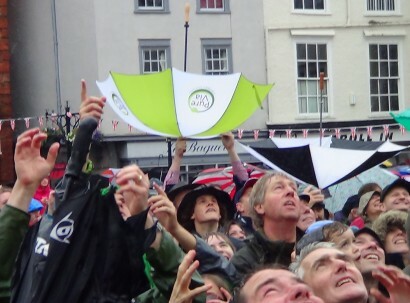 I have been looking back at umbrella pictures and found lots in June 2012, the month of the Diamond Jubilee celebrations. 1. An audience enjoy a performance by Larkmead School choir on Abingdon Market Place. 2. 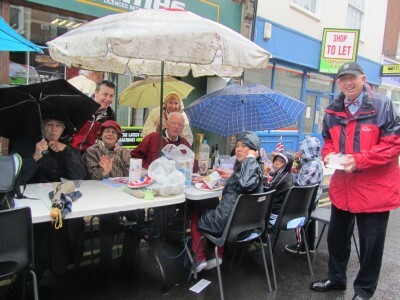 A group from St Helens Church enjoy the Jubilee street party. 3. 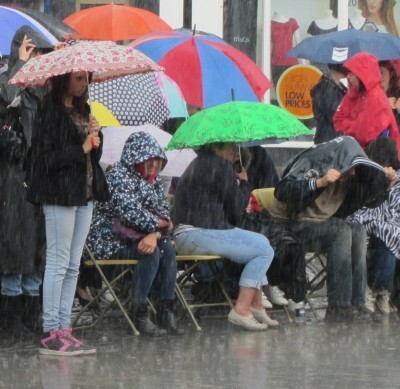 Umbrellas being held Abingdon style during the Jubilee bun throwing – to catch the buns. For more Umbrella pictures go to City Daily Photo February Theme Day. A NHS Children’s clinic now occupies part of the Clock House, which when opened in 1882 was home to a Conservative Working Mens Club. Three reliefs of Tory Grandees and a magnificent window adorn the front. It is good to see repairs now taking place before the rot sets in. For more information on the reliefs try John’s Miscellany which he did for the blog in January 2010. 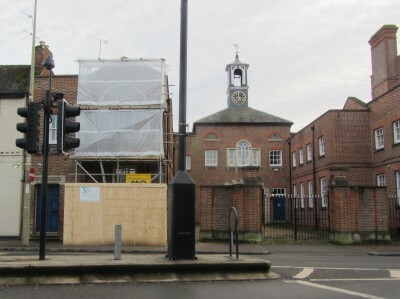 I and maybe others in Abingdon are is still hoping there will be a 2nd John’s Miscellany. 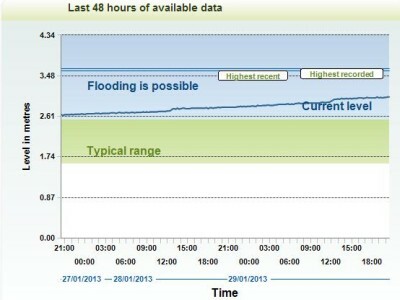 One of our North Abingdon correspondents has found a web page showing the level of the River Thames at Abingdon Lock – rising steadily again. 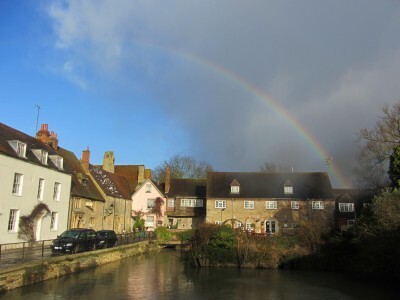 There was a rainbow over the Upper Reaches, on Sunday, during one of a number of showers. The night before, and after, there was heavy rain. Any remaining snow has been washed away, and this evening the Ock Valley path is already under a few inches of water again. 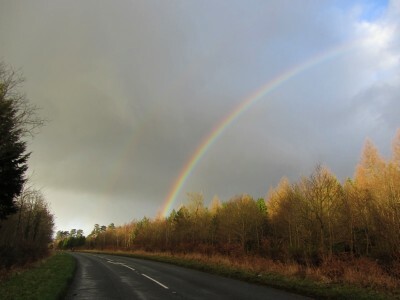 Another rainbow was visible, on Sunday, over the road beyond Lodge Hill, currently closed by a landslide. 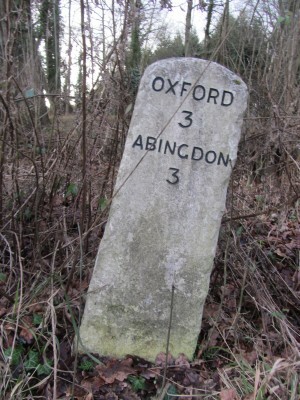 That is halfway between Oxford and Abingdon. It is not a way we normally walk but there is the opportunity now that it is almost car free. 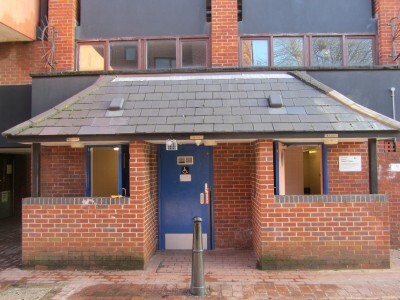 Have Abingdon Public Conveniences had their day? In November, the Vale of White Horse District Council asked people to respond to a survey of what services are important to them. 20 people (15%) thought public toilets an important public service. 36 people (26%) thought council car parks an important public service. 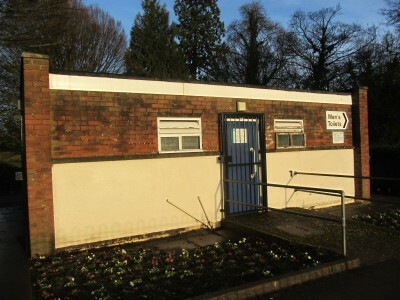 As a result it appears from last weeks Abingdon Herald that council officers have suggested that the council could save money, by closing the public conveniences. 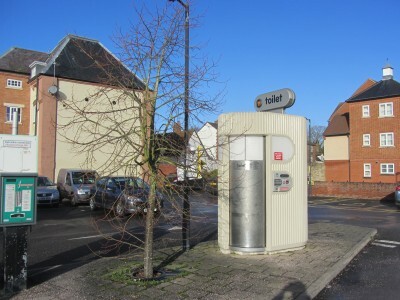 The superloo in the car park near West St Helen’s Street has already been decommissioned and is waiting to be taken away. It was probably the least used. 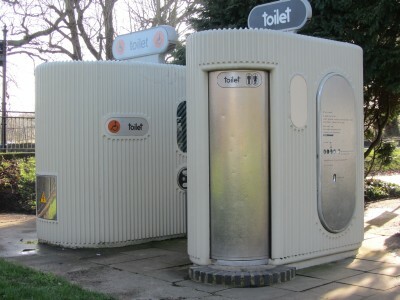 The superloos near the cricket club could follow. And that at the Charter. Another question in the survey asked which services are in most need of future investment. 37 (27%) said public toilets. 24 (18%) said Car Parks. 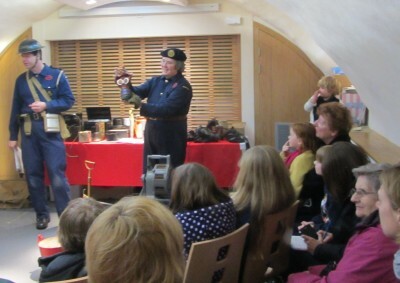 Yesterday in the basement of the County Hall, in Abingdon, Air Raid Wardens gave demonstrations throughout the day about what to do in case of a WWII air raid. Given that Abingdon is close to an RAF base, and close to the MG tank factory, there is a serious risk that an attack by German bombers may hit the works or town. Incendiary bombs like the one in this picture have caused a lot of damage in cities such as London, and Coventry, but they could be used against Abingdon. 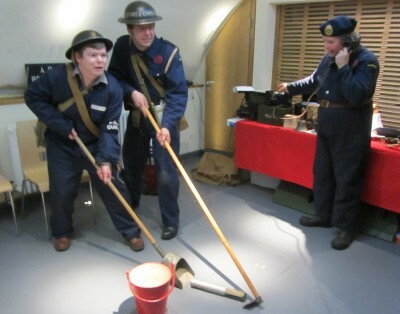 We were told not to handle UXBs (unexploded bombs), but to scoop them up with the hoe and pan, and then put them into a bucket of sand. 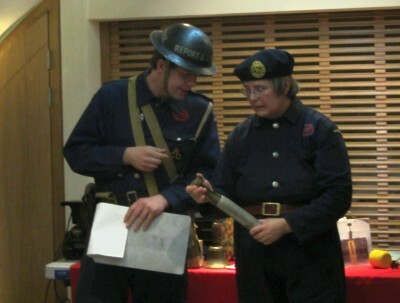 We were also told about air raid shelters, and how to put on gas masks. Gas masks have special filters, and include a layer of asbestos, and should be carried at all times.